There are times when having a nice living room just isn’t enough. You need something more, something special. A room that’s all about entertainment. Somewhere fun. Your own game room. If you’re going to put the effort into something, you may as well do it right. At Black Pine Spas we’ve been helping people to build their perfect game rooms for over three decades, so we must be doing something right. If you are ever unsure or just need some help deciding talk to any of our experts at 425-771-5774. We offer free shipping to anywhere within the continental US! Do I Have Enough Space For a Game Room? Before you rush right in and start filling up your game room, it’s a good idea to look closely at the space you have available and evaluate if a permanent game room setup is right for you. 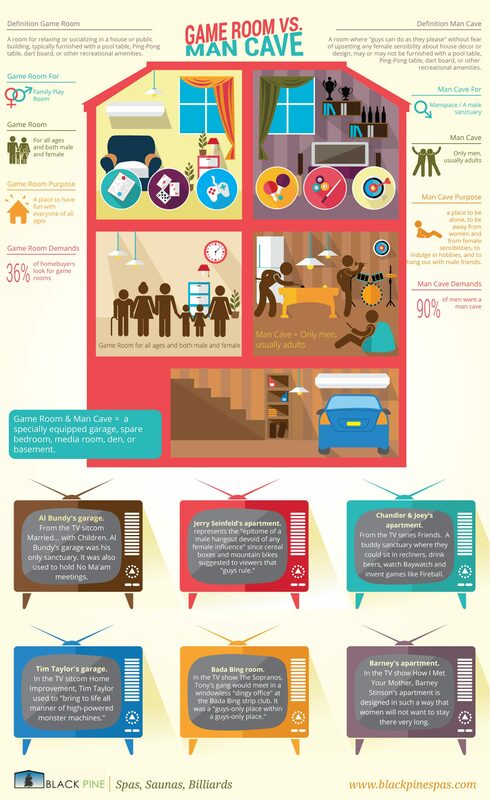 Obviously, spare and little-used rooms are great candidates to be converted into dedicated game rooms. Basements, attics, and unused bedrooms are all waiting to be transformed into gaming havens. It’s amazing how many people have unused dining rooms or second living rooms, begging to be made useful. Garages and sheds can also be made extremely comfortable with some effort and TLC. You might be surprised at just how easily that spare room can be made into a useful game room. There’s no need to fret if you don’t have a free room to convert. You might still be able to add some gaming features to your living room, or any other free space. It’s all about making use of the room you have. What Kind of Game Room is Right for Me? Family Rooms are all about providing a space where you can spend time together as a family, so they should be comfortable and packed with things you can do together. Pool tables, shuffleboard, and foosball are all good additions to the family room. Kids Rooms tend to be focused around activities to keep your children active and happy. Good planning is essential to help keep the room tidy, providing places to store away paints and board games, and an environment that’s conducive to creativity. There’s nothing to stop you playing along though, especially if you tuck a pool table in! Media Rooms are all about comfort, coupled with state of the art technology. You’ll probably want to equip a home theatre system and plenty of comfortable seats. The ‘Man Cave’ is all about you – your own little haven to escape from the world and be immersed in your passions. It may be called a Man cave, but there’s nothing to stop you from creating your own Woman cave too – why should it only be men who need to get away from it all? Whatever you need, you’ll find it at Black Pine Spas. We’ll help you to design your gaming room from scratch and incorporate all your preferred features, from the smallest to the most important. You’re sure to go away happy. We’ll settle for nothing less than to provide the best game room tables Seattle has available. When you shop with us, you’ll receive all the benefits we offer our valued customers, including financing options, free shipping within the continental United States and our 110% Best Price Guarantee. With the biggest showroom in Puget Sound, which you can also view online, why would you go anywhere else? We’re open 10am-6pm Monday through Saturday, 12pm-5pm on Sundays, and you can find directions at our contact page. If you’d like to speak to a member of our team, you can call us at (800) 896-5405 or (425) 771-5774.